The art of fishing for swordfish has always been special because it was always changing. And it is still changing. 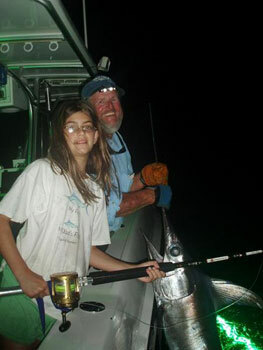 To target swordfish today you can fish day or night. The difference between day and night swordfishing is like night and day. Daytime swordfishing is done in 1500 to 2000 feet of water. The bad news is that these fish are on or very near the bottom. We use 12 to 18 pounds of "paver" bricks to carry your dead bait down to the bottom. Most days we use an electric reel with a manual crank option to do this fishing. If a fish bites you fight it like any super gamefish. Man against beast. If there is no bite, then the electric power brings up the bait and weight. If the angler gets tired he can call in the electric assist and catch dinner. The other daytime option we use is IGFA and tournament legal. We use a Penn 70 International. We fasten the weights to the rig with light line and if we don't hook a fish, then we break the light line and bring up the rig without the bricks. If you get a bite it is man against beast to the end. The best way to catch the best gamefish. Either way it is one line fishing at a time. The wait for a bite is very intense and a constant vigil must been kept watching the line for a bite. The biggest draw to daytime swordfish is the fact that they average over 150 pounds while night time swordfish average under 100 pounds. For the record, on Bouncer's Dusky 33 we caught a 545.8 in the daytime this past June. 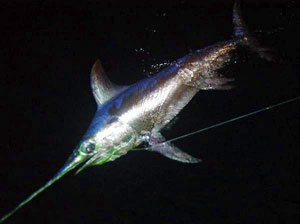 We caught, tagged and released a swordfish estimated at 600 pounds at night in March of 2002. 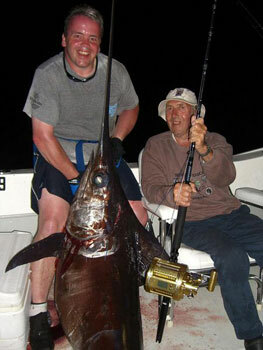 Numerous 400 pound plus swordfish are caught during the day between August and November off south Florida. Night swordfishing is a whole different game. We drift along with 4 lines in the water. Two lines are away from the boat suspended under floats and two lines fished straight down. The baits range from 50 to 500 feet below the surface. All fishing is with Penn Internationals and the fish are caught by IGFA rules. In this evening fishing multiple hookups can occur, you are drifting along under the evening sky and the fishing is very relaxing till the bite causes a diving float or screaming reel. The best swordfish season is August through November. Swordfish are abundant in our waters through the winter, but weather can make trips challenging or impossible at times. 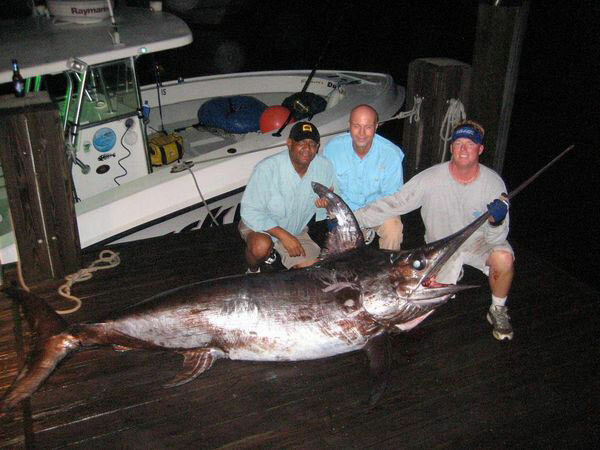 Some swordfish are found off south Florida year round. Whether you are interested in hunting a monster swordfish by day or catching any swordfish in the evening, we are ready to make your fishing dreams come true on Bouncer's Dusky33.